I just joined another swap. I know, I'm obsessed, I admit it. This is a fiber-friendly Scavenger Hunt swap. 1) Do you knit, crochet or both? How long have you been doing it? I knit. I can crochet just enough to do some finishing stuff. 2) What is on your needles/hook right now? A. An adult version of the Harry Potter baby hat from Weekend Knitting (with a much simpler colorway) that I've been promising to my son forever. B. Some very quick dishcloths for a different swap. ....and let's not talk about the old UFOs. 3) What is the most frequently used tool in your knitting bag? I have one of the kits with interchangeable circular needles. I use them constantly. 4) What are your 3 favorite yarns (fiber type or brand)? What are your 3 least favorite? Eyelash, acrylic, other synthetics, even blends with synthetics (except funky stuff like this), lace and sock weight. I like natural fibers in DK weight or heavier. 5) What is your favorite color? I guess dark red. I also like lots of greens (but not kelly green). 6) If you had a 5 minute shopping spree in your LYS, how would you plan your attack? Interesting question. I'd plan for some specific projects, make a floor plan, and then add some other fun stuff at the last minute. Hmmmmm, I'm not sure. I like the big version of Maggie's Tote Bag that I made for my sister a year or two ago. It was pre-Flickr... sorry. 8) What are your favorite things to knit/crochet? 9) Do you collect anything? Depression-era kitchen stuff (Fiestaware, bakelite, etc. ), cookbooks. And yarn (and fabric), of course. 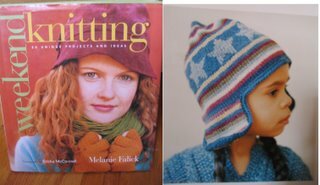 10) What are your five favorite things (not necessarily knitting related)? Making art/crafting, my family, my home, gardening, cooking. 11) Are you on Ravelry? What is your ID? Yes, but I haven't gotten very involved yet. Need to do it soon, eh? My ID everywhere is winemakerssister. 12) Do you drink tea/coffee/cocoa? Yes. I like 'em all (although I can't take much coffee with caffeine). My basic drink is tea. Smoke. Nothing else that affects the swap. 15) Do you have pets? kids? Yes. Yes. We have a Golden Retriever and four cats. One teenaged son (Tommy). you are too much! Where do you find all these good times! ?